Jan Hahn’s The Secret Betrothal made it on to the Best Austenesque Historical Novels 2014 on Austenprose’s list this year. The Secret Betrothal is a Pride & Prejudice Alternate Path story in which Fitzwilliam Darcy learns that Elizabeth Bennet is secretly engaged to another man which ruins his chances of winning her hand, but fate keeps throwing them together. 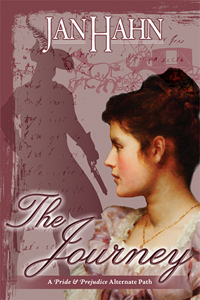 Jan Hahn has also been honored with making this respected list within the Austenesque genre in 2012 with The Journey which also earned the Reader’s Choice Award, and in 2011 with An Arranged Marriage with the Best Indie Book Award. Hahn is currently working on another Austenesque book due out in 2015 titled Stolen Past. I must admit I didn’t find Elizabeth’s behavior all that unfathomable. This is partly because Jan Hahn did an excellent job creating a believable sequence of events that gradually lead Lizzy into such a predicament. Lizzy doesn’t immediately accept Wickham’s proposals or request for secrecy, but she does eventually consent due to her compassion for Wickham and her inexperience with men (master manipulators like Wickham are definitely beyond her ken!). I think Elizabeth’s sympathetic nature, sense of justice (Lizzy champions the wronged!) and her belief that she may one day have a love match like her aunt and uncle (who she just discovered weren’t in love when they wed) also steer Lizzy on this unlikely path. Keeping secrets from her sister and engaging in a deception is definitely not a part of Lizzy’s character…but women everywhere often make mistakes for the men in their lives. 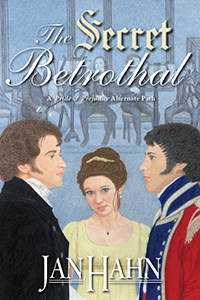 Read the rest of the review at The Secret Betrothal – Jan Hahn – Austenesque Reviews. I loved this story! The Secret Betrothal is a wonderful retelling of Pride and Prejudice that takes us down a path different from the original. I love it when an author takes my two favorite characters and puts them in some new situations, just as Jan Hahn has done in this one. What if, Elizabeth was so angry and hurt by Mr. Darcy’s “tolerable” remark and haughty behavior that she goes against her better judgement and accepts a man under conditions that she usually wouldn’t do? She lets her judgement of the man cloud her sensibilities, and she blindly accepts Mr. Wickham’s tales. And what if, knowing Mr. Darcy as well as he does, Mr. Wickham realizes there may be another way to seek his revenge…by taking away something that Mr. Darcy really wants. Elizabeth. There is so much I enjoyed about this story! We all know Mr. Darcy and Elizabeth will have their happily ever after, but the fun is getting there! I loved watching Elizabeth learn what an honorable man Mr. Darcy truly is, and what a rogue Mr. Wickham is. In the end, I found myself wondering if Mr. Wickham could actually regret his past behavior, and if Elizabeth really could have made him a better man. Read the rest at So little time…: The Secret Betrothal by Jan Hahn. Hello, dear readers. Today I am taking part in The Secret Betrothal Blog Tour set up by Jakki of Leatherbound Reviews. The author of the book, Jan Hahn was my guest last month and I interviewed her for the post. Today, Jan is my guest again but she is interviewing me, since I did the covers for The Secret Betrothal! We are discussing author/artist collaboration on cover art. I hope you enjoy the switch in places! There is also a giveaway so be sure to check for the details later on in the post. JANET: Yes, I need to read the book. I like to get a feel for the story as well as determine if any scene immediately stands out in my mind. If so, is it one that I can draw and make it grab the reader’s attention? I want the cover to be unique, to tell something special about the story without giving away the plot. JAN: If the author has no idea what she wants on the cover, how can you help? Continue to read the interview at More Agreeably Engaged: Switching Places…The Secret Betrothal Cover Art. From the author: This excerpt from Chapter Seven takes place the morning after Darcy’s disastrous first proposal. Elizabeth is on her way to mail a letter to Mr. Wickham. Observing that it would still be an hour or more before the postal office opened, Elizabeth decided to detour close to Rosings’s lush, green park. Her natural buoyant personality soon could not be contained in such beautiful surroundings, and she proceeded toward one of her favourite walks. Recollecting that Darcy sometimes went there, she stopped and instead of entering the park, she turned up the lane that led farther from the turnpike road. Soon, she passed one of the gates into the grounds. She was tempted by the pleasantness of the morning to stop and look into the park. The five weeks she had passed in Kent had made a great difference in the country, and every day was adding to the verdure of the early trees. She longed to enter the park and ramble among the greenery, but she caught a glimpse of a gentleman within the grove that edged the park, and fearing that it might be Darcy, she began to retreat. The person who advanced, however, was now near enough to see her, and he stepped forth with eagerness. “Miss Bennet,” he called out. She stopped and reluctantly turned to face him. “Mr. Darcy,” she murmured, returning his look without flinching. Elizabeth stepped back as he held out the folded, white pages with her name written across the outside. “I . . . I cannot,” she said. Read the rest at Everything Books & Authors – Blog. The Secret Betrothal by Jan Hahn is one of those books where, as a reviewer, you don’t want to give too much of the plot away and spoil it for readers. What I will say is: In this P&P alternate path Elizabeth engages in a secret betrothal with Wickham. Yes, dear readers, you read it right. Lovely Elizabeth is engaged to Wickham, who for once isn’t portrayed as a complete villain, and she doesn’t tell a soul, not even her dearly devoted sister Jane. Let me stress the point again: This is an alternative telling of P&P. Those of you who are P&P purists who want Elizabeth solely with Darcy may want to keep an open mind when starting the Secret Betrothal. Elizabeth and Darcy do get their HEA, but there is a whole lot of the wicked Wickham thrown in the mix, which I devoured like manna from above. I will admit, when I started the book I was a little skeptical. I mean really, who wants to see Darcy’s hopes of winning Elizabeth’s hand crushed? I suppose the evil reader side of me kind of wanted to see Darcy squirm a little—I know, I know, I am sure vile emails will follow. But, admit it, you kind of want to see it too. Although once I started the book, I was hooked. Having previously read Hahn’s novel, The Journey, I knew I was in for treat. Not only does Hahn write outstanding plots that stay true to the core of P&P, her male characters are some of the strongest that I’ve seen in Austen adaptations, which is one of the reasons you should add her novels to your Austen collection. Read the complete review at Addicted To Jane Austen: The Secret Betrothal by Jan Hahn. I have to admit I started this book with a mixture of skepticism, disbelief and curiosity. You could say that after reading the synopsis I stared, coloured and doubted even. Why would a gentleman ask a lady to conceal their betrothal? Jane Austen writes of secret engagements in more than one of her novels, and in The Secret Betrothal, author Jan Hahn explores the question of what would happen if Austen’s most famous heroine from Pride and Prejudice reluctantly agrees to accept such a proposal. When Fitzwilliam Darcy learns that Elizabeth Bennet has committed herself to such an arrangement, his hopes of winning her hand are shattered. After circumstances continue to bring the two together—from Hertfordshire to Rosings Park to the seaside town of Brighton―he finds he is unable to tame his desire for the woman who has stolen his heart. Will Darcy’s efforts to win Elizabeth succeed, or will his sworn enemy lead her to the altar? Yep, that’s right. Elizabeth is engaged to Wickham. I’m a big fat scaredy cat and worried about Elizabeth possibly loving or thinking she’s in love with Wickham. But I also said I trusted the author to not lead me down a long, sad road of despair and thankfully she did not! Read the rest of the review at The Darcy Obsession: The Secret Betrothal Review. 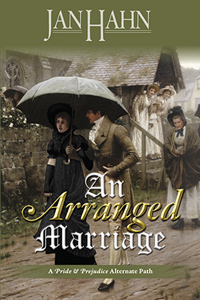 A chance meeting at Rosings Park, Fitzwilliam Darcy and Elizabeth re-new their acquaintance and he comes to find out soon after his unpropitious declaration of love that she is already engaged. Secretly engaged! Read the rest of the review at The Secret Betrothal: A Pride and Prejudice Alternate Path, by Jan Hahn – A Review | Austenprose – A Jane Austen Blog.